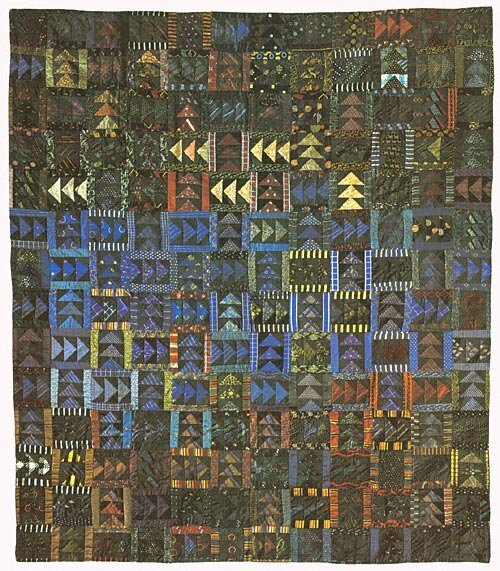 Made entirely of silks and satins, it is believed that this late 19th century quilt (54" x 64 1/2") was pieced from silk ties! You construct your version however you wish, although instructions for using ties will be given. This quilt lends itself to machine methods, but the hand piecing instructions are also included. Start collecting those out-of-date ties and make your own memory quilt. This is also dazzling in jewel tone cottons. Rotary dimensions, hand piecing directions and paper piecing templates are included. The quilt label illustrations are cleverly remniscent of the tie labels sewn onto the insides. No quilting is necessary as the original is tied.